The Alabama Theatre and the River Oaks Theatre; the two go hand in hand. Both were built in 1939, less than a month apart. 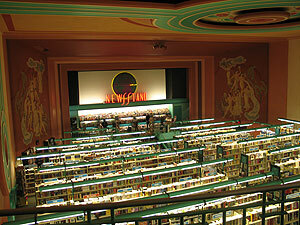 The Alabama ceased operations as a movie theatre in 1983, although the structure still operates as a retail space. When it opened in 1939, the Alabama was Interstates tenth theatre in the Houston area, the others being the Metropolitan, Majestic, Kirby, Delman, Eastwood, North Main, Tower, Bluebonnet, and the Yale. In addition, it was the first and largest of four November openings, with the independent Stude, Navaway, and River Oaks theatres following. Its opening feature was Man About Town, with Jack Benny. Later remodelings included that of the lobby on two occasions, updating the undersized concession stand, and rebuilding the box office into the theatre front. 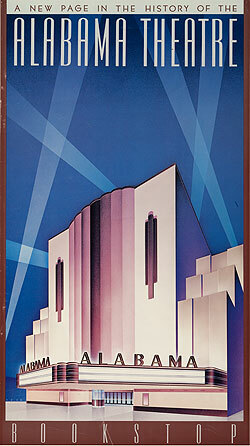 Original plans for a shopping center to surround the theatre eventually took place. Featured films during the Alabamas history ran the gamut from The Glen Miller Story to blockbuster titles of the seventies and eighties, such as The Sting, The Omen, The Towering Inferno, American Graffiti, and Reds. The Sound of Music attracted audiences for over a year during its run. Long lines of science fiction fans wrapped around the building in 1977 for Close Encounters of the Third Kind, Alien in 1979, and The Empire Strikes Back the following year. Competition from multicinemas, cable television, and videotape cut deep into Alabamas attendance and profits. 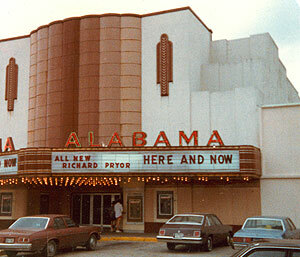 The movie era of the Alabama died in early December 1983. Its final presentation was the low-budget horror flick, Mortuary, a title that paralleled the theatres final days. 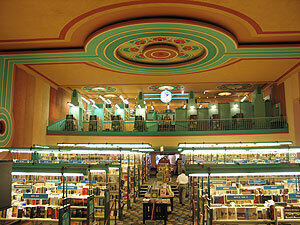 The entire Alabama Center underwent a facelift, and after a careful restoration of the theatre space, the former movie house was reopened as a Bookstop book store. Efforts were made by various local groups to save these structures, including an August 1, 2006 appeal to Houston City Council, and a petition drive. Society philanthropist Carolyn Farb spearheaded a preservation effort in front of the River Oaks Theatre on August 30, with a crowd of supporters wearing black Save Our Shrines T-shirts. All of this was of of little use. A portion of the historic 1937 shopping center was unceremoniously razed, and replaced by a brand new Barnes & Noble store. As expected, the Alabama Bookstop was immediately closed. In 2011, the interior was partially gutted, and the slanted floor leveled and cemented in. It's new tenant, a Trader Joe's grocery store, opened in September 2012. For links to past media coverage on the Alabama and River Oaks theatres, click here. 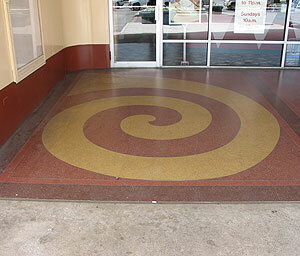 The inlaid design on the walkway outside the lobby; a spiraling: yellow motif that bears a suspicious resemblance to the yellow brick road from The Wizard of Oz, which opened at Loew§s State three months prior to the Alabama's opening. Whether the similarity is deliberate or mere coincidence is a matter of speculation.